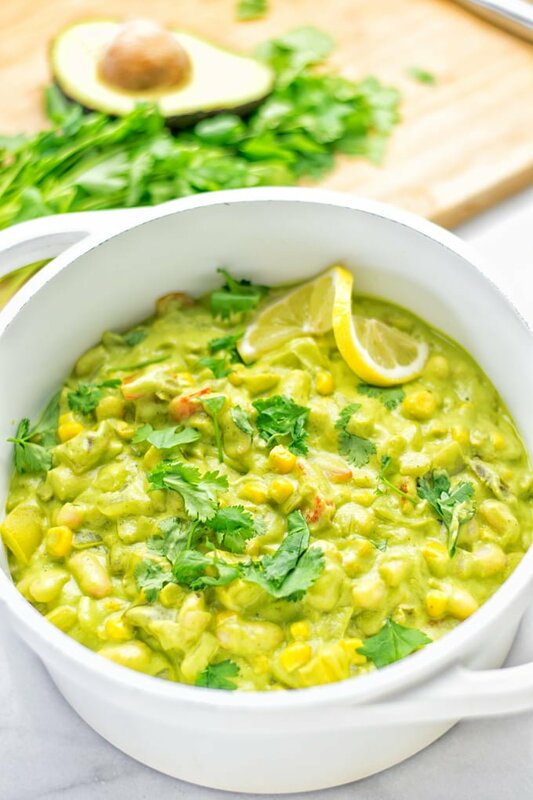 This incredibly mouthwatering Vegetarian Chili Verde is naturally vegan and gluten free. A super easy one pot meal so insanely delicious that will knock your socks off. Summertime is here. I can smell all blossoms in the air. Can you also feel the summer vibes? Yes we’re in the middle of my favorite season. 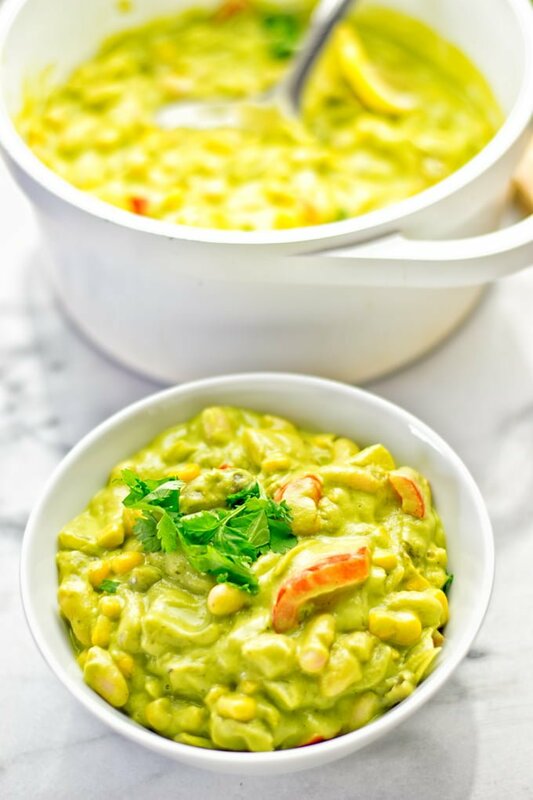 What could be better than to enjoy these vibes with a big bowl of my favorite vegan chili recipes, like the Vegetarian White Chili. Nothing, really! If you need some more easy chili recipes, look no further, use the search bar, and get hungry. This Vegetarian Chili Verde is no exception to the list of amazing chilis. A lip smacking combo in and out: It’s hearty and budget friendly. 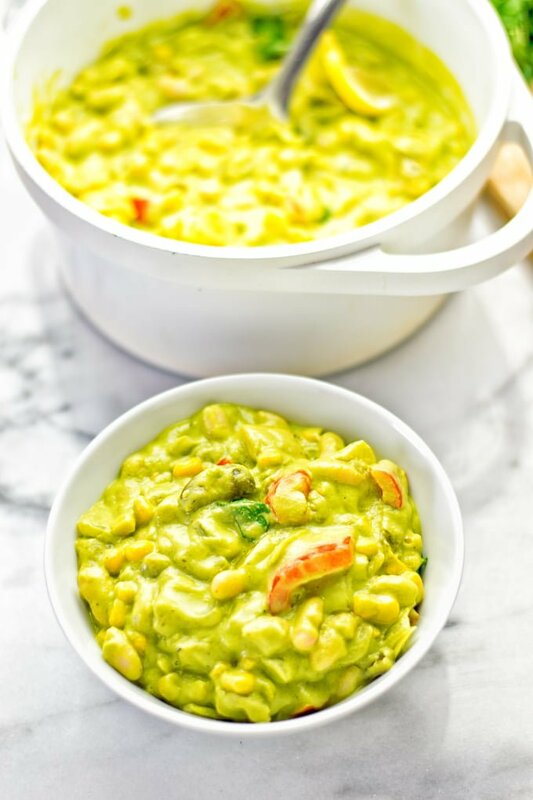 More importantly, it’s protein rich, packed with really satisfying flavors, one ultimate feel good food, creamy, fresh, healthy, meal prep ready, time saving, effective and filling, and all you want for one pot meals. 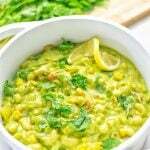 Chili Verde is a traditional Mexican inspired dish. It isn’t diary free or plant based but made with pork, often from the shoulder, chicken broth. Sometimes it’s served with cheese. 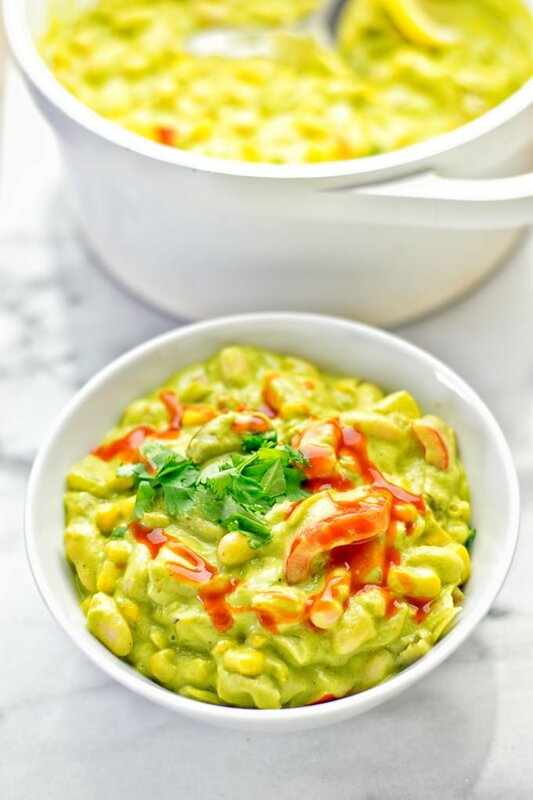 So this Vegetarian Chili Verde is something different, like other traditional versions you can find. But equally delicious and super satisfying, I promise. My word. When you eat this you won’t miss the meat. It’s so filling with the white beans. Before we’re going to take off straight to the kitchen, you see in the ingredient list the Avocado Pesto Pasta Sauce. You can make it ahead or you might want to prep it now. It’s so easy. 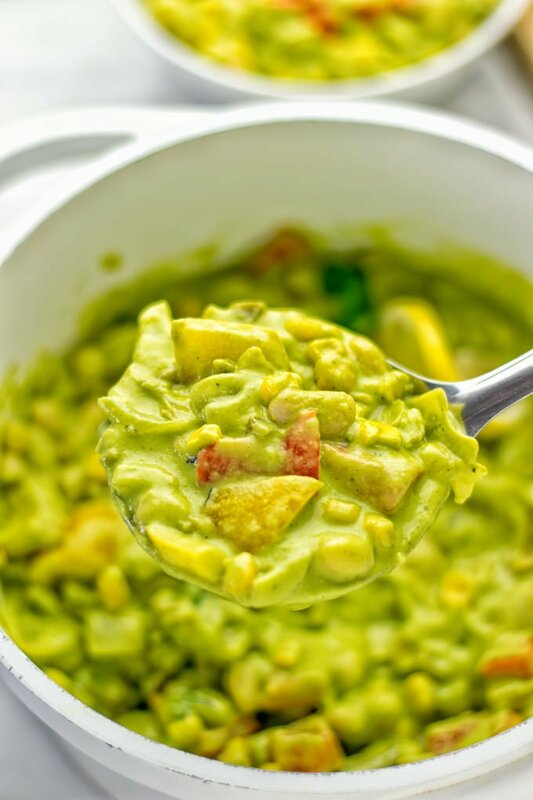 All you have to do is combining avocado, water, garlic, cashew butter, and lemon juice in a blender or food processor. Season with salt and pepper. Could it get any better or easier? I don’t think so. See, just process until smooth and creamy. That’s my way how to know what is verde sauce. Enough said, let’s get started. Heat a pot with a bit of vegetable broth, if you wish oil free cooking, or a bit of oil. Add chopped onions and bell peppers to that pot and fry for around 4 minutes. Next, add vegetable broth, drained jalapeños, white beans, and the optional add ons such as corn or coconut milk. Transfer the Avocado Pesto Pasta Sauce to the pot and cook all for 5 minutes more, done. Serve finally in bowls and enjoy. It’s delicious plain but you can serve it with rice or quinoa as well. I guess it’s also really good with some pasta or some bread like this Hummus Homemade Bread. 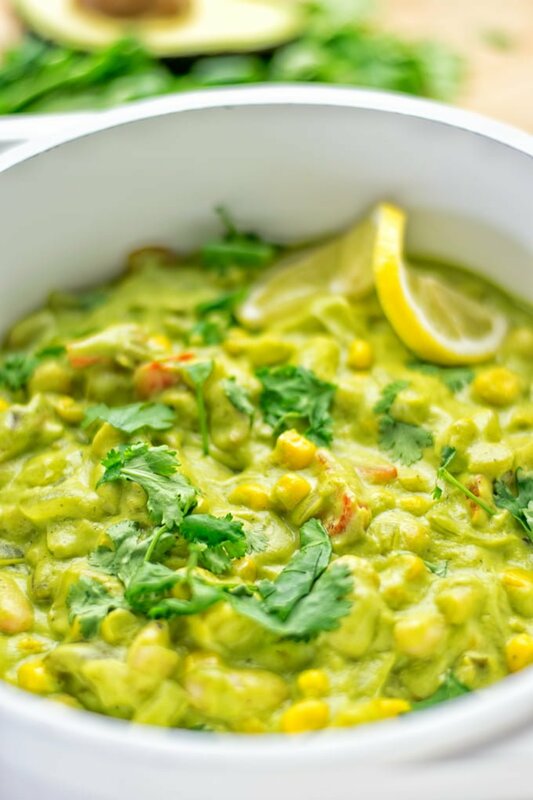 The Vegetarian Chili Verde is an amazing dinner, lunch or a great find for all your potlucks. Also meant for meal prep, work lunch, and ready in 10 minutes. 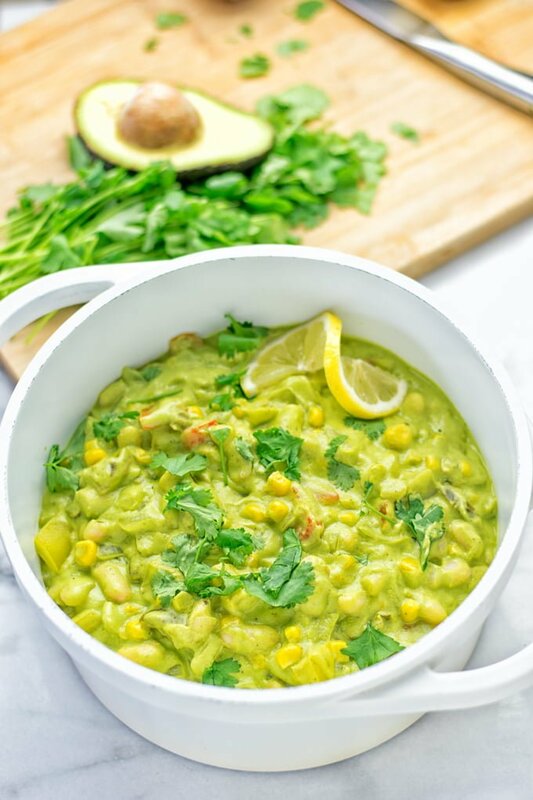 I tried this Vegetarian Chili Verde with a traditional verde sauce made from lemon juice, herbs, garlic, and olive oil. To be honest, I found it ok. But my mind was constantly thinking how can I do it just better and take it to the next level. That’s when my avocado pesto pasta sauce comes into play. The best way to make green chili you will happily admit if you give this a try, friends. Seriously it really makes this dish. Don’t skip, leave out anything, or use something different. It won’t be the same flavor experience as it’s meant to be. If you give this a try I’m always happy to see your remakes with a tag on Instagram or Facebook. Snap a picture and show off. Heat a pot with a bit of vegetable broth, if you wish oil free cooking, or a bit of oil. Add chopped onions and bell peppers to that pot and fry for around 4 minutes. This looks delicious! I mainly cook vegetarian and love making chilis, but I’ve never thought of making a green version before. Can’t wait to give this a try! Thank you for sharing. Thanks, Sharon! Let me know what you think!